Want to make some fun and easy gifts for the backyard chicken keeper on your list? It's too late to start the plants this year, but a couple of hills of egg gourds might fit the bill in 2012. 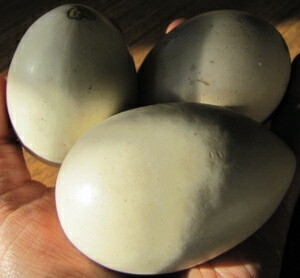 The egg gourd is a type of decorative gourd that looks astonishingly similar to chicken eggs. 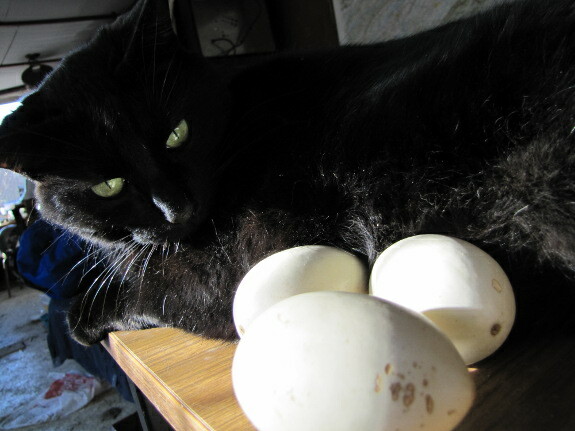 Maggie gave me three, which will soon be replacing golf balls as nest eggs in the chicken coop. If you do a google image search for "gourd eggs", you'll see dozens of crafty alternatives to make use of these non-edible squash. Need a chicken-related present this year? Give the gift of clean water with a POOP-free chicken waterer. I have some wooden eggs that my folks picked up at an auction this year that work well. Those gourds are very cool, though! I didn't know such a thing existed. I assume they are climbers like other gourds? I love the idea of using these astonishingly similar gourds as egg-inducers, but I would worry that once they get to the point when they'll begin to rot that the chickens might sense it before the people do and then eat it. And while I don't know if it's true, I've heard that it's likely that chickens who realize eggs can be eaten will try to. I would worry that once taking a crack (no pun intended) at the vegetable version, that they would peck the real ones. Your thoughts? Heath --- I haven't actually grown them, but I think they probably do grow like other gourds. Brandy --- Excellent point, and one which I hadn't considered. I'll let you know if anything like that happens, but I suspect it won't. Things like feather picking and egg eating seem to happen mostly to people who keep their chickens confined so they're bored and don't get enough animal protein. Our chickens are ranging far and wide and don't seem to spend enough time in the chicken coop to notice something edible in the nest.